WORD UP: The need to see the bigger picture (for Spoken Word Poets). The need to see the bigger picture (for Spoken Word Poets). Life has taught us not to always see things in black and white, for there are always shades of grey. The business expert had always advised that one of the ways to run a successful business is to discover a need and fill it. Reality has shown that delayed gratification leads to an extended run of inflows. History has shown that pride cometh before fall. Common sense has shown that helping others succeed will make you excel. As an individual, I had a “9 to 5” I did and could had comfortably live off on it, with no complaints. However, one day I had a dream with my eyes wide open and ever since then, I have not slept soundly. I had a dream of building a business around my passion, which was to create an industry for Spoken Word Poets in Nigeria. We all know that, no man is an island, and the wise people will say, life is life with others. So I told my “crazy” dream to my friends and as many people that cared to listen. Many laughed it off, some offered advice, others offered criticism, yabs, mental evaluation and the likes, but a special few decided to support this “crazy” dream of mine. How do you write a business plan on creating an industry? Well, we didn’t. I wrote down what I saw, my friends / partners wrote what they think I should see. We read it, we argued, we discussed, we fought, we reconciled and then we agreed. 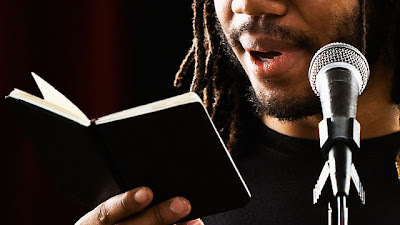 We started in February 2012 co-organizing, a monthly open mic poetry show (Chill and Relax). Co-organizing is actually a fanciful word for “apprenticeship.” Yes, we were apprentices at a live poetry show (well, we still are, and please do ask, are you a learner?). This afforded us the opportunity to see how things were being done. We gained experience, publicity, media relations, contacts and content, (over a 100 poetry clips and still counting). Fast forward to August 2012, and we held our own first major show, WORD UP (a Spoken Word Poetry and Soul Music Event). People said it was a success, I personally felt we could do better. So we kept at it and since August 2012, we have held WORD UP on a quarterly basis. After the 3rd edition in February 2013, we decided to go bigger than before and take a giant leap by inviting a foreign poet. As fate would have it, we met Shihan Van Clief and he agreed to come for our show on May 18, 2013, WORD UP Volume 4 (hey, you are invited to attend). Let me add that since we started, we have had support at different points in time from 3 different organizations. Ok, why all this “history and development?” well, because, we saw a need, “unemployment” and we decided to fill it. We saw the bigger picture of the various ways Spoken Word Poetry can be used. It can be used as a genre of entertainment, a tool to increase literacy level, and a means of communication among people across the globe. Ultimately, we can use Spoken Word Poetry to create employment for poets to earn a decent living from their amazing performances. But all these might never materialize if we don’t consistently and persistently organize Poetry Shows, create awareness, promote poets and remain in the public eye through providing them with relevant content. Do we get paid from these? NO. Do we have a big sponsorship deal? NO. Ok, do we have any sponsorship deal? NO. Do we make money from the gate takings? NO. Where do you get the money to finance it from? From personal savings. But why do it if it is not profitable? Nobody will pay you for what you want to do, but they will pay you for what they have seen you do. Money follows value. Industries don’t grow if the “beneficiaries” go insisting that they must get immediate gratification. Go ask Ali Baba and Opa Williams. Of course one or two “beneficiaries,” might be making money now, but one out of many is nothing. Besides, if building an industry was that easy, why didn’t someone do it earlier? Building an industry requires forgoing self, and becoming selfless. It requires sacrifice, putting yourself on the line to make the dream a reality. For instance, imagine if some 10 to 20 years ago, only Ali Baba went to perform at shows, do you think the comedy industry would be where it is right now? Ali Baba took people like Basket Mouth, AY and the likes along with him to shows, so that people could see it was more than just a one man thing. If Ali Baba had been concerned about having to share the “Naira and Kobo” he was to be paid, would he have taken others along with him? And pray tell, is Ali Baba still not relevant in the industry? Can anyone authoritatively say all the comedians that performed there got paid? Both the well-known and the unknown. Opa Williams started Night of a thousand laughs comedy show which helped grow the comedy industry in Nigeria. As at when Night of a thousand laughs started we had maybe 2 or 3 well known comedians. If they had insisted on getting paid before featuring on the show, I bet you the comedy industry would still be in a state of comatose. But look what we have now, these days many comedians command decent performance fees, because you don’t need to explain what comedy is all about, people know it. As Spoken Word Poets, we all need to see the bigger picture and come together to make this thing work. Life is a team sport, playing as a lone striker/ player means you might not get the passes you need , or might not be able to hold on to the ball long enough for someone to get a pass from you. Thus you play till you are worn out and the desired results won’t be forthcoming. Let me conclude with this, “He who waters will also be watered himself.” The general principle of a great life, is that of living for the good of others, because in doing that, we shall be profited ourselves.